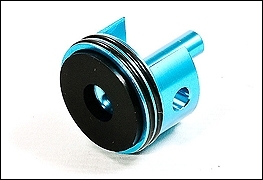 CNC machined for the utmost precision the Action Army Cylinder Head makes an excellent replacement or upgrade part for X36 Gearboxes (Version 3 Type). The cylinder head was designed to help funnel the compressed air created from the gearbox's piston and piston to help BB's propel through the air. With this precisely engineered part that comes complete with 2 O-ring seals and rubber disc seal no energy is wasted putting more power behind each BB for each shot to improve your airsoft gun's FPS. Made out of high quality aluminum alloy and finished to a stunning anodized teal finish, the Action Army Aluminium Alloy Cylinder will help you stand out from the competition. head to improve the air compression of your gearbox to improve your FPS.